I live in sunny San Francisco Bay Area and am an Environmentalist, Educator, Entrepreneur, and Artist (and now a blogger!). After more than two decades in public service and academia in California, I left cubicle confinement to breathe some fresh air. My journey took me to many places and I am looking forward to exploring even more. I was fortunate to join a team of experienced hikers for the Mt. Everest Base Camp trekking expedition. Dr. Dipak, an accomplished Surgeon, is a seasoned traveler who has led 8 trips to Mount Kailash & Lake Mansarovar and has also served as a research team physician at Antarctica for four months. He can effortlessly switch from performing a complex surgery to – fixing a tasty meal at the tiny tea-houses kitchens to – assisting hikers in medical needs on the trail – to keeping our trekking logistics under check. It was a blessing to have Doctor Saheb (an honorific term we use to call him) as our de-facto team leader. Manubhai: When not serving the world with renewable energy projects, Manubhai likes to travel, meditate, and simply having fun in life. He has traveled to Mount Kailash & Lake Mansarovar with Doctor Saheb and is always up for a new challenge. With his joyful and friendly personality, he made many friends on the trail, most notably some Korean hikers in their golden years. Manubhai was our chief negotiator and helped us secure the best deals for all of our helicopter rides. He brought homemade mouth-watering power-packed “Sukhadi” for all of us that gave us much-needed nourishment and comfort throughout the trek. Oh.. and it perfectly complimented it’s celestial partner deshi ghee Thepla doctor Saheb brought for all. Kamlesh dances on his own tunes. After a successful corporate career he is now a semi-retired global consultant pursuing other interests. As a minimalist, he didn’t carry many bells & whistles, not even a camera! He is a multi-tasker and can tell you where you will get the best cell phone coverage as he kept in touch with the outside world while on the trail. Like Doctor Saheb, he can also fix a yummy meal using whatever they have at the teahouses. He surprised us by making Dabeli (tasty India street food) at Thukla (4620 meter). Varun: The youngest in our group was always at the forefront of our daily trek (along with Dr Saheb & Rush). Varun is also a seasoned traveler and has been to Patagonia, Kalalau Trail, and other trails. He is a technocrat and had the best camera phone (Samsung Note 7) as evident from several photos and panoramas on this website. I was flabbergasted when he showed me an App on his phone to measure blood oxygen level and pulse rate. We compared it with the dedicated Pulse Oximeter Doctor Saheb carried and it was spot on! Rush is a veteran backpacker with over 18 years of travels in 42 countries under his belt (or should I say backpack?). Having trekked in Himalayas, Inca Trail, and other exotic locations, he knows how to rough it on the trail. A week before joining us in Kathmandu, he did an arduous (and near life threatening!) trip to the Everest Base Camp from the Tibet side. Against his Tibetan doctor’s advice, he joined us after a brief rest in Kathmandu. His tips on footwork during steep treks helped many in our group. He graciously obliged to our guide’s advice “स्नान करना आवश्यक नही हे” i.e. bathing is optional while on the trail. They Make Things Happen ! As they say, “It Takes A Village to Raise A Child” – you may need a whole lot of ground support to successfully complete the EBC trek. In our case, we had three porters, two guides, and a travel agent in Kathmandu to assist with our entire trip. Deepak and Bahadur, our two porters carried our duffle bags from one teahouse to the next. I was thoroughly impressed by their strength, professionalism, and humbleness. Their positive attitude, cheerful nature, and willingness to land a helping hand was admirable. We also hired a third porter along the trail to help us with our daypacks so we can take a break. 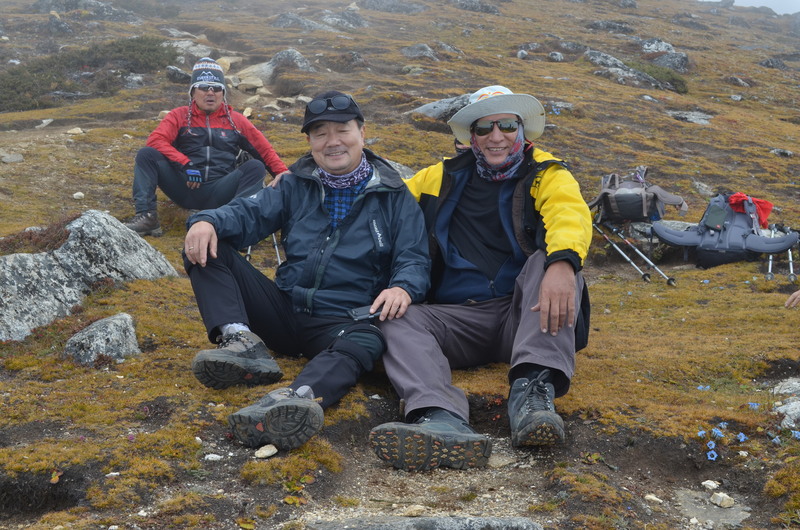 In addition to the porters, we hired two guides, Deepak and Tshering. Deepak, a Nepali Brahmin from Kathmandu (left in above picture) splits his time working in the office of our travel agent, helps with airport pick-ups and drop-offs, and also serves as a trekking guide when needed. Since there is really no advanced reservation system for overnight stays at the teahouses, Deepak trekked ahead of us to set up our night stay well in advance so when we reach at the teahouse we have a room ready for us. The guides also help out at the teahouses with serving food and other chores. Every evening, he will bring us the dinner menu and take our order a few hours in advance so the kitchen staff can prepare our meals on time. His calm attitude, ever willingness to help, and arranging for us to cook our own meals in teahouses kitchen made a big difference. Our Sherpa guide, Tshering, was my constant companion throughout the trail and I really enjoyed talking with him (we both speak Hindi) and learning about his family, life in Nepal, Sherpa culture, and his years of experience assisting Himalayan trekkers. Unlike Deepak, he mostly works in the field and has over 10 years of experience guiding trekkers at Annapurna Circuit, the Everest Base Camp, Mt. Kailash and Mansarovar, and helping with the Everest Summit climb up to camp 3. He shared fascinating stories about Sherpa polyandry, cost of Mt. Everest Summit climbing, economic disparity among the Sherpas in tourism business, his two-year stint as a chef in a Khumjung teahouse, etc. etc. He was always willing to lend me a helping hand when required and keeping me safe from the Yak train. Almost every day, he will run into his Sherpa guide friends on the trail, will catch up with the trail news, and update me on whats happening in the valley. The Sherpa Valley logo is an original design inspired by four things: (1) the Buddhist endless knot (or the infinity knot) which is an intricate design of looped intertwined lines representing eternal continuum of mind. (2) the top part of the logo is inspired by the crescent and a dot (“Bindu”) representing pure consciousness (“Atman”) in various depictions of Hindu & Buddhist Om (or Aum), (3) the vertical profile of the logo with repetitive shapes is inspired by the stacked stones you see all along the trail, and (4) the contrasting colors of snowy white Himalayan peaks and the gray mountains constantly accompany you on the trail. Read more here…..